I don't blame anyone for wanting a better a pension. However I think the deal from the government, the improved offer, which is on the table is actually a pretty decent one. I do think while negotiations are ongoing Union bosses have been wrong to try and march their members up the hill. I have a huge amount of respect for public sector workers who simply want a fair deal for the future, but I am disappointed that some of the big Labour supporting Unions seem determined to turn this into a party political fight which doesn't help anyone, especially their members. Thank you, Mr Deputy Speaker, for giving me the opportunity to raise this matter in the House. Bowel cancer affects men and women, and it is the second-highest killer after lung cancer. The debate is, I suggest, both timely and genuinely needed. I have personal experience of the NHS that is probably too long to list. When I was a jockey, I was saved by a gastro-surgeon at Warwick hospital. I hoped I was riding the winner at Stratford races, but we turned over and the horse ruptured my spleen, perforated my left kidney and broke nine bones in my ribs. I can assure the House that it hurt a great deal. The surgeon saved my life on that occasion. Subsequently, it is well known that I had a meningioma in April and was recently given the all clear by Mr Neil Kitchen and the amazing staff at Queen Square hospital in north London. My grandmother was an NHS matron and I have had bowel cancer screening. Certain family members have had this cancer, so I had the colonoscopy that was medically advised in those circumstances. I would certainly not be an MP were it not for the campaigns I waged on behalf of Savernake hospital in Wiltshire, where I was born; that hospital also saved my mum’s life. I would like to declare an interest as a taxpayer. The NHS’s approach to individual screening is surely an issue in which we should all be interested—from the point of view of prevention of loss of life and the maintenance of good health, but also in respect of how NHS funding, which is clearly finite, is spent on preventing future problems. I pay tribute to the Beating Bowel Cancer regime, to Cancer Research UK, to the British Society of Gastroenterology, and to Professor Wendy Atkin, her funders and the 170,000 volunteers who took part in her definitive study of flexible sigmoidoscopy, which is known as a flexi-scope. I also pay tribute to Imperial College London, University College London, the University of East Anglia and St Mark’s hospital, and to the variety of doctors, constituents, charities and members of the public who have worked so hard to combat this problem and have helped me to prepare for the debate—including the clinicians, particularly Dr Colin Rees. As a Member of Parliament representing a constituency in the north-east, I am proud to say that the north-east leads the way in bowel cancer screening. It was the first to complete coverage of an entire region in April 2010. Before I embark on the substance of my argument, I also make an apology on behalf of my hon. Friend Nadhim Zahawi, who sponsored the Beating Bowel Cancer reception in the House last year. Much to his regret, he cannot be here tonight. 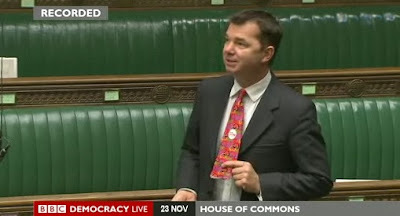 He is a good friend of mine, but he is well known in the House—and, indeed, throughout the world—for having worn the Beating Bowel Cancer tie, which I am now wearing, in the Chamber after that reception. My hon. Friend, who has quite a generous build, was attempting to restrain that generous build with his suit when he accidentally touched a button on the tie, setting off a melody that lasted for nearly two minutes. Madam Deputy Speaker virtually extracted him from the Chamber. I understand that the incident was reported in 25 countries, and did more for the screening of bowel cancer worldwide than anything that anyone has said since. I have no future as a surgeon, and I assure the House that I have removed the bottom half of my own tie so that there is no possibility of my being extracted from the Chamber for being too musical. Let me now make some serious points about the clinical position. Traditional bowel cancer screening involves the faecal occult blood test, known as the FOB. In the last few years 11 million people in the country have been offered the test, 6 million have accepted it, 120,000 scopes have followed, and 12,000 diagnostic findings of cancer have resulted. It is clear from the statistics that lives have been saved. Previously those screened were aged between 60 and 69, but screening has now been extended to those aged between 60 and 74. It should be noted that the north-east—leading the way, as it does so often in a medical context—was the first region to extend the age group. Tragically, take-up of that vital free NHS screening is only 54%, whereas take-up of breast cancer screening is 74% and take-up of cervical cancer screening is 79%. However, the situation is changing. Professor Wendy Atkin and her team have brought flexible sigmoidoscopy to the forefront of bowel cancer screening. The results of their 16-year study were definitive. Their randomised trial, which followed 170,432 people, established that the flexi-scope examination reduces the incidence of bowel cancer in those aged between 55 and 64 by a third. Mortality was 43% lower among that group than it was in members of the control group. The flexi-scope test works by detecting and removing growths on the bowel wall, known as polyps, which can become cancerous if left untreated. It can prevent cancer from developing by removing polyps before they become cancerous, and provides long-lasting protection from bowel cancer. This a strong package of growth measures which will boost the North East economy. The Chancellor is clear things are tough and I think the Government is right to focus on using every resource at their disposal to build growth, without putting our economy at risk with more debt and more borrowing. Making it easier for small businesses to lend is something I often hear and the Chancellor’s steps in this area will be welcome, as is the extra £1billion for the Regional Growth Fund and the increase in the Bank Levy. The funding for infrastructure projects, especially the bringing forward of improvements to the Tyne and Wear Metro, will not only bring real improvements to the North East but also help keep investment flowing in these tough times with special relief for the North East. The Chancellor was clear that things are tough, but there is real help for the North East in this statement, including the state pension rising by £5.30 to £107.45, the largest ever cash rise, and not least cancelling January's 3p Fuel Duty rise, saving families £144 is real help for where it counts. 80 MPs or their caseworkers squeezed into Committee Room 18 of the House of Commons last wednesday to hear the FSA explain the proposed deal to Arch Cru investors, why the offer letters are so confusing and why they are not going after other potential parties. We have formed an All Party Group to seek a better deal for investors - thousands have lost money up and down the country. Today saw the formation of an All Party Parliamentary Group on Arch Cru. Mr Alun Cairns MP Vale of Glamorgan and Mr Tom Greatrex MP Rutherglen and Hamilton West were elected as Co Chairman of the Group and Guy Opperman, MP, for Hexham, as Secretary. Two key people of the Financial Service Authority were in attendance. Committee Room 18 in the House of Commons was packed with over 30 MPs and representatives for 50 additional Members to hear a one hour discussion. This proved to be very helpful and a very positive response from given from the FSA. A list of key issues were raised and key answers given. b) to try to get all other parties, including those not under their regulatory responsibility into one room to have a global discussion on the ongoing concerns and settlements. The Group resolved to ask Capita and the Financial Services Ombudsman to attend a future meeting. The matter was also raised by Mr Greatrex in the House of Commons at Prime Minsters questions at which the Mr Cameron agreed to consider what further actions could be undertaken. The FSA stressed that the urrent offer is solely limited to HSBC, Bank of New York and Capita FM and no other parties. They reiterated their view that the current offer is a good deal against those three parties. Everyone who knows me knows I am sport mad: I see it as part of my job to try and facilitate more sport in the North East, and obviously Hexham in particular. We have the Olympics next year - both with specific events in the North East, and lots of school Olympics and the extra special East Tynedale Olympics that is being organised out of Wylam. These last few weeks I have met with the Sport and Recreation Alliance, and following that had meetings with the British Mountaineering and Canoe Associations, working out how we can make their sports more accessible to local people in Northumberland. This culminated this week with a really good meeting with representatives of the Lawn Tennis Association: we are at the early stages of planning specific tennis assistance and events in the North East, and Hexham in particular, but watch this space. My plan is, in particular, to get a LTA professional to go to several of the schools during the early part of the summer term and provide free coaching and assistance, whilst also harnessing the LTA contacts and know how to try and help make the sport accessible to all in the build up to Wimbledon and the Olympics next year. Last week was a very busy week in the House. I was pleased that the Backbench Business Committee of MPs agree to my recommendation of a debate on the Future of UK Manufacturing. I used the debate to argue there should be a dedicated government minister for manufacturing to boost British industry. Such a minister would genuinely provide a co-ordinated response to concerns of the manufacturing businesses and would send out a statement that this really matters. Manufacturing should be at the heart of any long-term plan for economic growth. It is a sleeping giant which, if revived, would become the backbone of a strong UK economy. You can CLICK HERE to watch the debate. 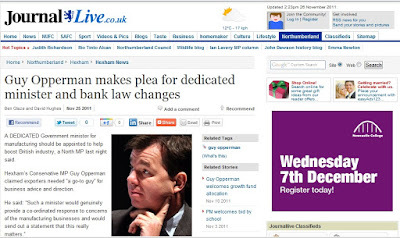 You can also read full coverage in the Journal HERE which also includes details on my call for a Bank of Hexham... more on that on the blog next week! Regular readers will know I am passionate about tackling Youth Unemployment, it is a very important issue for his here in the North East. I therefore welcome today's news of a £1 billion scheme designed to get more than 400,000 young people into work. Speaking on the fund Mr Clegg quite rightly said this Government would not allow a “generation to fall behind” and “bear the brunt” of the recession. “Youth unemployment is an economic waste and a slow-burn social disaster,” he said. “We can’t lose the skills and talent of our young people, right when we need them most. We can’t afford to leave our young men and women on the scrap heap. We need the next generation to help us build a new economy. The fund is a big improvement from Labour's future job's fund as the money will used to sponsor private businesses which take on unemployed youngsters rather than just creating jobs for them in the public sector like the future jobs fund did. Under the Youth Contract Scheme, 160,000 young workers aged between 18 and 24 will have half their wages paid for the first six months. The scheme will only pay half the minimum wage – worth £2,275 – to employers who will then make up the difference. Another 250,000 young people will be offered work experience, lasting up to eight weeks, during which they will continue to receive benefits. Money will also be paid to firms taking on another 20,000 apprentices. If your on Twitter don't forget you can follow me by clicking here or if your on facebook click here to find me there too. Don't forget you can also sign up the the new regular e-newsletter simply by putting in your email at the top of the page. noun. One who uses Twitter (the social network). One who "tweets." Police Commissioners, what will they mean? The first ever elections for Police and Crime Commissioners will be held on 15 November 2012. Some of you may have heard me on BBC Radio on Friday morning discussing the change this will bring to our police. Instead of bureaucratic control of the police the Commissioners we bring real democratic accountability to our policing with you the public having a real say over how our area is policed. Police Commissioners will be local figures with powerful mandates from the public to drive the fight against crime and anti-social behaviour. Commissioners will decide policing strategy and the force budget. They will set the local council tax precept and appoint - and if necessary dismiss - the chief constable. And all of this will be done on behalf of the public who elect them. Police and Crime Commissioners will replace the existing police authorities and have a much larger role. Working with local authorities, community safety partnerships and local criminal justice boards, Commissioners will help bring a strategic coherence to the actions of these organisations across each police force. Commissioners will be a single elected individual who will take executive decisions, supported by a highly qualified team. For the first time you the public will have someone in the room, at the very top of table who shares your priorities. The buck will stop with commissioners, and the public will cast judgement at the ballot box, voting out commissioners who don't cut crime or address local concerns. I hope we will end up with a real leader at the helm of Northumbria Police to continue to drive forward the improvements the force has made in cutting crime and cracking down on anti social behaviour. I try not to be too party political and criticise the Lib Dem led Northumberland County Council. But NCC would test the patience of a saint. We are now quite literally in the position of having to cross our fingers and hope there is no snow before the New Year, when the gritters arrive. Madness. As Victor Meldrew would say "I don't believe it!" Launching our Social Action Christmas with Anne Marie and Will, representing the Conservative party in Berwick upon Tweed and Tyne and Wear. This Christmas we are asking you to get involved in the North East’s biggest Social Action Christmas Project yet! We’re asking you to help us with one of our three projects focussed on supporting the needy, the homeless and our brave troops. If you have any time to spare this Christmas season please help us make a difference to those less fortunate than ourselves. We are asking you to buy one extra toy or child’s gift which can make all the difference to a disadvantaged child on Christmas Day. I know we are all feeling the pinch, and we are not asking for anything extravagant. Just a small gesture which can mean the world to a child who has little to look forward to this Christmas. our troops as a thank you. You can include a card or note of thanks or alternatively you can make your own shoe box parcel. Last year we started off the Social Action Christmas with the Parcels for Soldiers project. This year I hope we are going to be bigger and better than ever before, helping more and more people across the North East at this special time of year. Back in the House of Commons this week after a really busy week in Northumberland. Before another week of Westminster blogging kicks off I just wanted to report back on one of the highlights from last week. 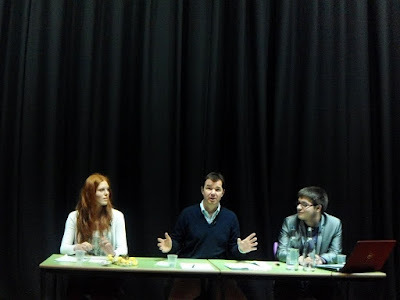 On Friday after spending some time with the Grassroots Team at Scotswood Community Garden, which we support with our Social Action team, I went off to Prudhoe High School for a Q&A with pupils. Whenever an MP does one of these events said MP will always duly report that the children were polite and friendly. Well I can honestly say, having done a number of these now, this was one of the best so far. Not only were the 6th Formers polite and friendly they were very engaging, their questions topped any edition of Question Time! 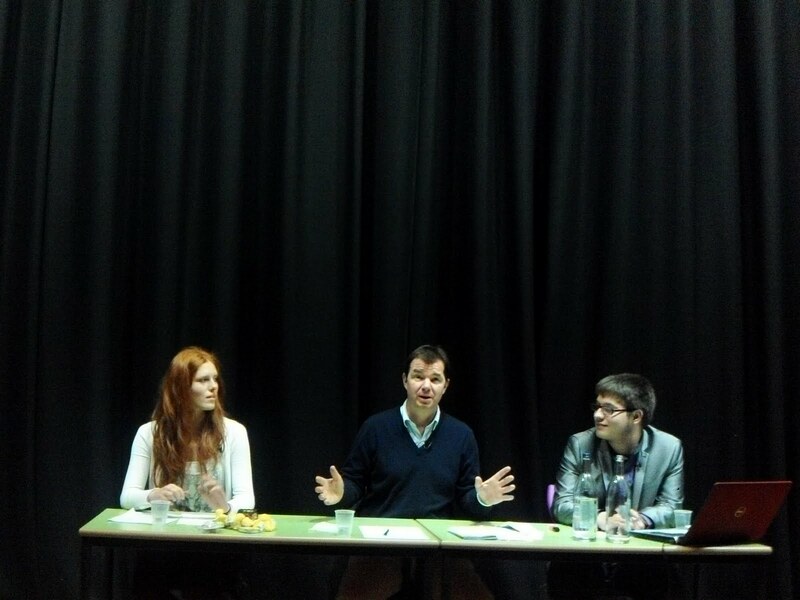 From Tuition Fees to Feed In Tariffs they gave a me a good grilling on the issues of the day for around 85 minutes. The Headteacher Dr Shaw is very proud of his pupils, and rightly so. I suspect I won't be the only one in the room who will stand for election! 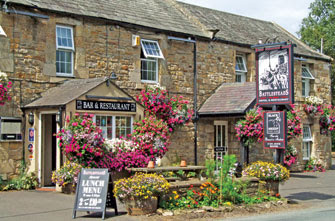 Battlesteads Inn, in Wark, Northumberland, wins Green Hotel of the Year - beating everyone including the Savoy! The Battlesteads is one of my favourite pubs - we hold events there all the time and it is a major destination and boost to the Tourist Business of Northumberland. On Friday the Pub won the Green Pub of the Year awards at the Cateys, the leading Hotel award. My congratulations to owners Richard and Dee Slade and all the team at the pub. I saw Richard at my Green Deal workshop in Hexham on Wednesday, when he was discussing his new woodchip burning biomass boiler. If you have not been to Wark - please go - it is a special place. “We are committed to providing the greenest possible environment while ensuring the maximum comfort for our guests. We hope you share our appreciation of locally sourced food, consideration of our individual carbon footprint, joy of wildlife and the natural flaura and fauna of Northumberland. Battlesteads proudly holds a Gold Award from the Green Tourism Business Scheme and is highly rated in the popular Alistair Sawday Guides to both the UK and Europe. In 2010, the hotel was crowned Best Green Pub and Great British Pub of the Year as well as scooping the Gold Award for Sustainable Tourism in the North East Tourism Awards. Green CredentialsThe use of low-energy light bulbs throughout means that the whole hotel now uses less energy for lighting than the bar area alone did in 2006. An innovative woodchip-burning biomass boiler supplies heating and hot water to the entire hotel using sustainable fuel from forestry only one mile away, meaning virtually zero fuel miles! The surplus heat generated is used to heat two polytunnels, which provide herbs and salad vegetables even in winter months. We also have herb gardens and salad gardens on either side of the main garden area and we plant soft fruits and root vegetables in our kitchen garden throughout the year. Rainwater is captured in a huge tank to provide water for the entire garden and planters. WildlifeThe walled garden visible from the conservatory is specially planted to encourage wildlife - the boiler house has a bat box and an owl box, we have lots of bird-feeders to encourage the many smaller species in the area. See how many you can identify - we have binoculars in the conservatory to help you. And if you want to see Red Squirrels and stay in a nice setting - this is the place. Each November, Movember is responsible for the sprouting of moustaches on thousands of men’s faces in the UK. The aim of this is to raise vital money and awareness for men’s health, specifically prostate and bowel cancer. Bowel Cancer is an issue I take a special interest in. Do have a look on the blog next week when I will report back on the Adjournment debate I have secured on this issue on Wednesday. 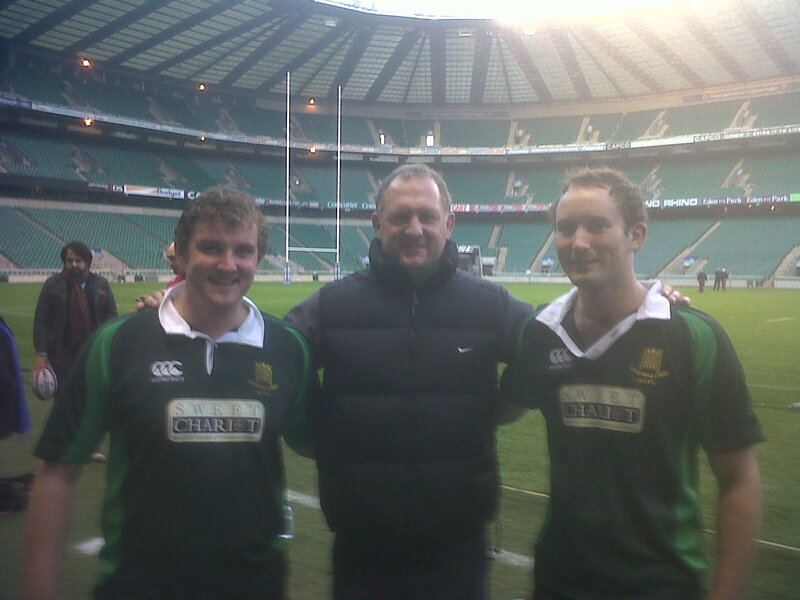 The lads also took part in a Charity rugby match last week and are very proud of this photo of them, plus the Rugby Legend Richard Hill (World Cup winner with England in 2003) at the Lords and Commons rugby match against the legends at Twickenham. This was all in aid of the Pakistan flood relief fund and hosted by the Princes Trust. There is an imminent threat to Greenbelt surrounding Ponteland and Darras Hall. Newcastle City Council wants to build 6,500 new houses on the fields that surround Ponteland and Darras Hall. These plans have been put forward by the City Council as part of their One Core Strategy plan to build 36,000 new houses. 5.25 Land on the Western Edge of Newcastle’s urban area between the A69 and A696 is identified as a Strategic Growth Area for up to 6,500 new homes." I have challenged the Labour controlled Newcastle City Council to stop the plan and withdraw these proposals. I think we can all agree that over the coming years Ponteland and Darras Hall will expand – after all it’s a fantastic place to live. But this development must be led by our local community, ideally through the Town Council, and done sensitively to local residents. What Newcastle needs, like many areas, is affordable sustainable development. You only have to drive towards the city centre to see a huge number of brownfield sites which could be developed, and areas where regeneration has stalled for too long or even stopped. What no one needs is the Council and big developers looking to make a quick buck off the back of a cash crop housing estate in the Greenbelt. 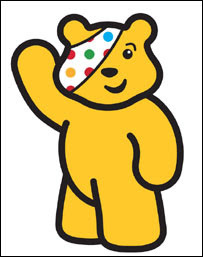 Children In Need is a great cause and one of those things that really does Britain Proud. Remember all money goes towards grants to projects in the UK which focus on children and young people who are disadvantaged. CLICK HERE to listen me taking calls this morning on BBC Radio Newcastle's live one hour phone-in. We discussed all things Policing from Police Commissioners to what changes to police budgets will mean for our communities. Skip to 2.40mins in. Some great calls and Alfie and Gillian really on form. Just a reminder! If you havent already please help bring Renewable Energy to the North East by voting for Hexham River Hydro in the Energy Share public vote. We are currently in 1st place but with 28% of the votes is really close! "Hexham River Hydro is a 100kW community hydro power generation scheme on the River Tyne in Northumberland, which will not just generate renewable electricity but will secure sustainable funding for social and economic regeneration and community activities in Hexham and its environs and be an education and awareness-raising tool for residents and visitors alike. It is a joint initiative by Hexham Community Partnership and Transition Tynedale." Friday Morning: have a packed diary - off first thing to do a live phone in on BBC Radio Newcastle, followed by our social action project, where we help out at the Scottswood Community Garden in Newcastle. Doing an hour long Q&A with the students after lunch in the Fuse Media Centre - the school is changing every year for the better. There are other amazing school based lip dubs on a smaller scale - simply search google, of course! Massive thanks to the Green Alliance for hosting our Green Deal Workshop - focusing on urban and rural fuel poverty in the Hexham constituency, and the wider North East. The Green Deal is an up front free programme used to provide household energy efficiency, and combat fuel poverty, with a staged repayment scheme out of your fuel bill savings. It will transform your energy bills and save you money in the short and long term. - but all agreed that as a programme for energy efficiency it needed work, refinement and basic changes if it was genuinely to be fit for purpose. That is where we come in - as 40 key stakeholders ranging from oil clubs to councillors, to Transition Tynedale and Friends of the Earth, from energy companies to the CAB, from social landlords to the HCP, many businesses and local providers and multiple interested parties, all disected the policy in detail: in doing so we identified the good points and the bad. - and what lessons we need to give to Greg Barker, the key Minister. - this policy needs change if it is to apply to social tenants [who arguably need this policy more than anyone] as few tenants would apply for such a policy. It will clearly work if the government wants to, and can afford to, give the deal direct to Landlords, like Isos. - Our long term target is to transform our area and make real efforts to combat the fuel poverty and energy deficiency that exists in Hexham. One final note: what was also amazing was seeing everyone interacting and talking about their common interest in this issue. Many thanks to Green Alliance - a very rewarding 3 hours. 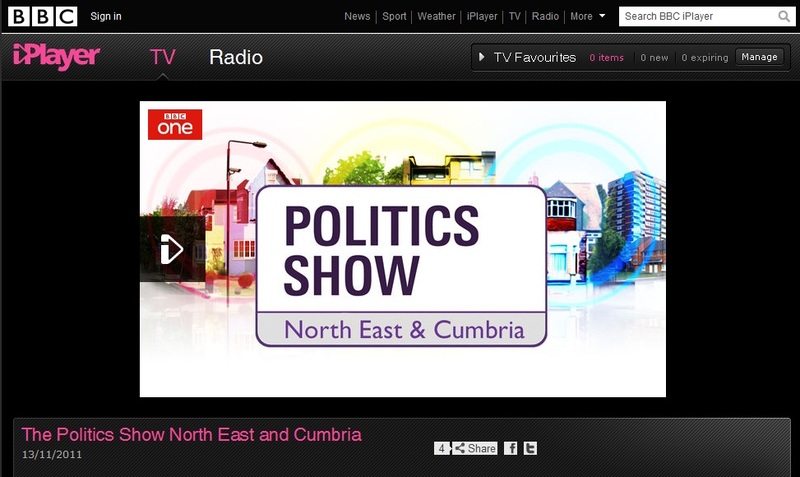 to catch up with the Politics Show from Sunday. I was on the show with Labour MP Dave Anderson to discuss Fuel Poverty and Legal Aid. The North East part starts about 32minutes in. I have had to be in Northumberland today so I have missed the Fair Fuel debate brought forward by my friend Robert Halfon, the MP for Harlow. Robert came to Hexham in April and is a genuinely good man trying to do what he can for his constituents and others. This issue touches upon my campaign to stop fuel poverty and is a real issue in Northumberland where a car is a necessity, not a choice. Certainly that was the view of the locals in Tarset who I was speaking to on this issue on Saturday. 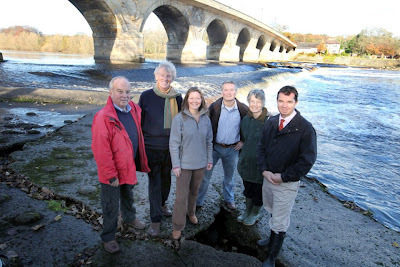 On the banks of the Tyne at Hexham, with local organisers Bob Hull and Gillian Orrell, Local Councillors Terry Robson and Derek Kennedy and Euro MP Fiona Hall. This is a community based apolitical attempt at bringing green energy to Hexham. Huge credit must go to the team at the Hexham Community Partnership, Transition Tynedale and the supportive local councillors. We are all behind the scheme but need your support - you do not need to live in Hexham to support us - see below. Hexham River Hydro is a 100kW community hydro power generation scheme on the River Tyne in Northumberland, which will not just generate renewable electricity but will secure sustainable funding for social and economic regeneration and community activities in Hexham and its environs and be an education and awareness-raising tool for residents and visitors alike. Once established the Hydro will use the 2 left hand arches seen in the picture for power generation, or as an alternative a tunnel based scheme harnessing the Tyne's power. HEXHAM RIVER HYDRO has been shortlisted for the final round of the national energyshare competition. The winning project will be decided by online voting which opens on Tuesday 15th November and closes on 3rd December 2011. 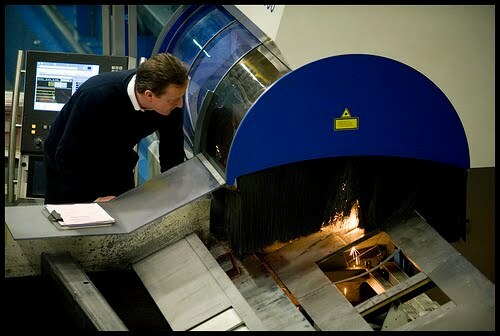 Vote now at http://www.energyshare.com/hrh and help us bring £100K to the north east. You can also watch Roly Beevor's excellent video showcasing the project if you go on the Energy share website. It really shows how this is a community based Hexham project. Keep Northumberland Whole! Have you had your say? It is not too late to email the Boundary Commission at reviews@bcommengland.x.gsi.gov.uk or simply write to them at 35 Great Smith St, London, SW1P 3BQ. Their proposal is to take Haltwhistle and the South Tynedale Divisions of Northumberland [which includes Allendale, Slaley, Allenheads, the Allen Valley, and the whole of the South Tyne] and put them in a County Durham seat. We oppose this and are trying to keep these areas - and returning to Consett the division of Rowlands Gill and Chopwell, which the BC in their wisdom have given to the Hexham constituency. Don't let them carve up your county simply by inaction or the lack of a letter or email! Delighted to be invited to hold a community meeting / surgery for nearly 2 hours this afternoon in Tarset Village Hall. Really great to be back - we discussed all the problems of health and police services in rural communities,forestry, planning, fuel poverty / LPG problems, boundary changes, fuel pricing and so much more. My thanks to everyone who came, and their hospitality and my friend Chris who kindly acted as driver. The Tarset community takes in several hundred fascinating people who contribute so much to the society they live in - based around the villages of Lanehead, and Greenhaugh, which has a great First School. The area is in the National Park and the locals think more about their life, environment and actions than almost any other community I know. Very excited to be co-hosting a Green Deal Workshop this coming Wednesday 16th November. 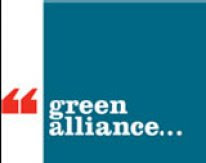 I am really pleased that the Hexham area has been chosen as the first of the Green Alliance's flagship pilot projects to work out how the Green Deal will work and the massive savings and opportunities that will follow as a result of the Energy Act that we recently passed in parliament. Tomorrow is Armistice Day - try and stop and remember those who died for us. I lost a great uncle on the beaches of France at Dunkirk. We all have friends or family who have served or are serving still. Can the England Team wear a Poppy on their black armbands? This was raised twice in the House of Commons today at PMQs, where the actions of FIFA were again castigated for being out of touch and disrespectful to those who have laid down their lives for all of us. Fifa has now agreed that the England team can wear poppies on their black armbands during Saturday's friendly against Spain at Wembley.The move came after Prince William and Prime Minister David Cameron made representations to Fifa asking that England be allowed to wear shirts embroidered with poppies. The Prince was described as being "dismayed" by Fifa's initial stance. "The Duke's strong view is the poppy is a universal symbol of remembrance, which has no political, religious or commercial connotations," said a statement. FIFA should be ashamed of themselves. The North East will be amongst those regions benefiting from a £500m growth fund, it was announced yesterday. The Growing Places Fund, to be operational early next year, is focused on developing infrastructure projects, and getting currently-stalled projects up and running. Outside of London the North East is receiving the 5th largest amount of funding at almost £17m, out of the 15 other partnerships. The Fund is a key part of the Coalition's growth strategy, and will be used by the government's Local Enterprise Partnerships distribute locally. The Fund can be used for a wide variety of projects including development of strategic link roads, enabling the delivery of homes and commercial space - all with the aims creating jobs and securing private investment. The North East has a tough task in re balancing our economy. This cash is a welcome boost towards helping us achieve that aim and creating as many jobs here in the North East as possible. I have been cheered by some new statistics which show a huge surge in the number of apprenticeships in England. The rise follows extra investment delivered by the Coalition Government. The figures show the number of Apprenticeships in the North East has rocketed from 18,000 in the previous year to 34,000 for 2010/11. Hexham Constituency alone has seen an almost 50% rise. The figures also show 163,000 more people starting an apprenticeship in the last academic year compared to the year before, with Advanced Apprenticeships showing the biggest growth, with a 69 per cent increase. The Coalition has delivered by 2011 double the number of apprenticeship starts that Gordon Brown promised by 2013. This is fantastic news for our young people across the North East. This increase in apprenticeships delivered by this government is unprecedented. After one year we're clearly on track to deliver the extra 250,000 apprenticeships we promised. Apprenticeships are a vital tool for tackling youth unemployment and improving the skills of our workforce. Olympic Torch coming to Northumberland and going through Hexham, Prudhoe and so much more. Off to see George Clooney's election thriller "The Ides of March" very soon and conducting a readers poll: what is your favourite political thriller? - The Godfather [had no idea this was a political film! ]: Dianne Abbott, Boris Johnson and lots more - you have to worry! "OK ..what do we do now?" If you have not seen it - watch it. It will change your life - it did mine. BBC Meetings in the House of Commons - what should the BBC spend our licence fee on? The taxpayer spends £145.50 a year on the licence fee and the BBC is doing a review of how it spends this money on BBC output. I have had many representations from constituents, and also talked with my colleague, Esther McVey, the Wirral MP and former BBC and ITV presenter. We both agree that the BBC should be looking to safeguard certain key local facilites like Local Radio and TV, which are extremely popular with viewers for a multitude of reasons, and cutting back on BBC TV channels like BBC3 and BBC4 - that cost a fortune and very few people watch. Mark Thompson was very sniffy when I suggested that instead of salami slicing he should focus on what his audience wants [he cited the importance of screening every night of the Proms concerts from the Albert Hall as a justification for BBC 3 and 4]. One thing is very clear - all the MPs I met at this meeting [and previous ones] made cross party representations attacking the BBC chiefs for seeking to cut local services, as opposed to expensive TV. You can help by writing in yourself to the BBC before the December 21st deadline. Apparently the Proms lovers are writing to Mark so get your friends to give him the local view. The Olympics are coming to Northumberland - Get Excited! 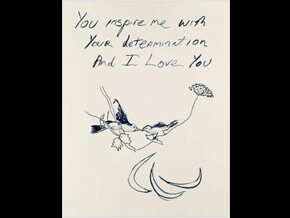 265 Days to go..
Am inspired and now off on a run! The great Bill Gates came to the House of Commons yesterday and met with Andrew Mitchell, MP, the International Development Minister, and MPs who were discussing foreign aid in the House yesterday. Sadly I had to be in a meeting with the BBC chiefs and could not go. Apparently Gates was amazing but sadly his own computer temporarily crashed when he gave a powerpoint demo - we have all been there! The serious point was their discussion of international aid and just how it is transforming the worlds efforts to combat disease and hunger. 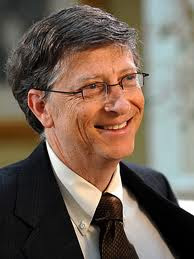 The flagship and most popular part of Britain’s aid budget is David Cameron’s commitment to the initiative of worldwide vaccination of children from diseases like malaria - working in partnership with Bill Gates and other philanthropists. The estimation is that the British taxpayer will save four million lives during this parliament alone! This is done by using this hard-headed initiative that works hand in hand with the private sector. The PM recently said - “What greater value for money can there be [than that]?" Aid is a difficult topic. The debate shouldn’t be about aid or no aid, but about what kind of aid works best? I have spoken on several occasions on this issue in Hexham over the last few years, and in my view the issue for this governement to try and achieve is whether our money is used wisely and with intelligence or given randomly and without thought. That should be the test. Today I attended the House of Commons and listened in the chamber to the annual sitting of the UK Youth Parliament (UKYP). UKYP has been going for the last ten years, giving a voice to young people across the UK. It consists of 600 members aged 11-18 representing all regions of the UK. Members are elected annually across the UK with over one million young people voting in the last two years. It gives its members the chance to organise events and run campaigns affecting the youth of today, whilst influencing key decision makers. John Bercow MP, the Speaker of the House of Commons presided over debates on various issues including Tuition Fees, Bullying in Schools, Transport, Child Poverty and Green Issues.I know that Tom and Nathan really enjoyed the experience. To his credit the Speaker ran the debate really well: there is no doubt that the UK Youth Parliament has shown that it is here to stay, and with very good reason! One of the successful bids from the regional growth fund was Visit England’s bid a three-year project ‘Growing Tourism Locally’. It's a bid I'm pleased to see be successful as I am big champion of our local tourism industry. Tourism is vital to our area and is a key local employer. The Visit England campaign will focus on inspiring us to take more short breaks and holidays at home - helping to give our tourism sector a much needed boost. James Berresford, Visit England’s Chief Executive commented: “This is a huge boost for Visit England as the country’s national tourist board, working in partnership to facilitate growth at a local level, and an acknowledgement of the value of our industry to England’s economy. With this additional money we can mount a serious campaign to stimulate domestic tourism that has the potential to create the equivalent of 9,500 full time jobs in areas across the country suffering economic challenges. The national marketing campaign will see Visit England working closely with private sector partners to match fund the grant received from the RGF. If you fancy a stay-cation in the UK there is no better place than Northumberland. Have a look here to find out why. We have officially taken the bid to rebuild Prudhoe High School to the very top today when at PMQ's I was able to raise issue with Prime Minister David Cameron. At today's Prime Minister's Questions I highlighted the lack of funding for Northumberland's High Schools in previous years and asked Mr Cameron to welcome bids for extra funding. The Prime Minister reassured me that the schools budget would be rising and told the Commons he 'will certainly welcome the bid" from the County Council to replace Prudhoe High School. It follows us raising the matter with Secretary of State for Education, Michael Gove, and Schools Minister Nick Gibb. If successful the bid would mean a brand new high school for Prudhoe as well as freeing up extra cash for the maintenance capital programme which could also see repairs to Haydon Bridge, QEHS and Ponteland High. The money could pay for new heating, replace windows, repair wiring and many crucial improvements. I am very pleased to have the Prime Minister back the bid and recognise the importance of funding our high schools in Northumberland. We await the final decision, and I will continue to do all I can to lobby in the bid's favour. It is great to be back on my feet in the House and tomorrow I am down to speak at PMQs - I am number 14 on the list so unlikely to be called much before the end. I will be all for short Questions and Answers from the PM and Mr Milliband! If given the chance I will be raising the case for updating Prudhoe Community High School...tune in to the Daily Politics on BBC2 tomorrow to see if we make the cut. It's a good time to be a Newcastle United fan at the minute - so happy we are suffering from vertigo! I regret to say that I missed the game last night, but the highlights showed a great perfomance to beat Stoke away from home. Whilst I was in the Commons speaking on the Legal Aid and Sentencing Bill, Ba scored a hat trick and sent us 3 points clear of Liverpool, Chelsea, Spurs and Arsenal. Statistically we have the best defensive record in the top tier. And whisper it softly but the team look a really settled side. There is a lot to be said for consistency of selection. Best of all, when Ben Arfa is fully fit we will give the Manchester teams a real hurry up.